Chris Gayle struck a belligerent half-century to guide Kings XI Punjab to a challenging 184 for four against Rajasthan Royals. In the match 4 of VIVO Indian Premier League 2019 (IPL 2019), Chris Gayle hit a belligerent half-century as Kings XI Punjab registered a convincing 14-run win over Rajasthan Royals in a controversial match at Sawai Mansingh Stadium on Monday. Opening the innings, Gayle started in an uncharacteristic fashion but grew in confidence as the innings progressed and helped Kings XI post a challenging 184 for four after being sent into bat. Buttler, in particular, looked in a destructive mood as he didn't spare a single Kings XI bowler and struck eight boundaries and two hits over the fence to notch up his fifty in just 29 balls. But just when it seemed Kings XI were running out of ideas, skipper Ashwin did the unthinkable as Buttler became the first victim of 'Mankading' in the history of IPL. At that stage Buttler was going strong at 69 off 43 balls. The dismissal is sure to raise fresh debate over the spirit of the game as Ashwin didn't give the Englishman a prior warning. Earlier, Rajasthan's decision to bowl first on a two-paced wicket was bang on target as K L Rahul lasted just four balls before edging an outgoing Dhawal Kulkarni delivery to wicketkeeper Buttler, who took a brilliant one-handed catch. 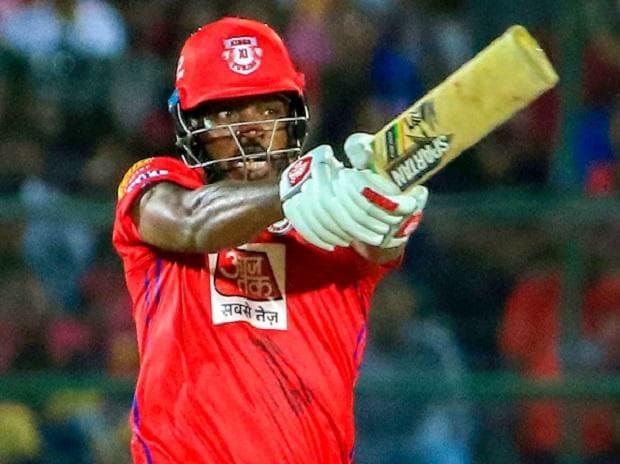 Gayle and Mayank Agarwal (22) then struggled to hit big shots against Kings XI's disciplined bowling as they garnered just 32 runs in the powerplay overs. The dou finally broke their shackles, hitting Jaydev Unadkat for a four and six to yield 13 runs of the bowler's opening over. Brought back into the attack in the 12th over, Unadkat was taken to the cleaners by Gayle as he hit the left-arm pacer for three consecutive fours and then a straight six over the bowler's head to bring up his fifty in 33 balls.